The mobile versions of both sites were not available either. “Sorry, something went wrong. We're working on it and we'll get it fixed as soon as we can,” said a message on the Facebook site. 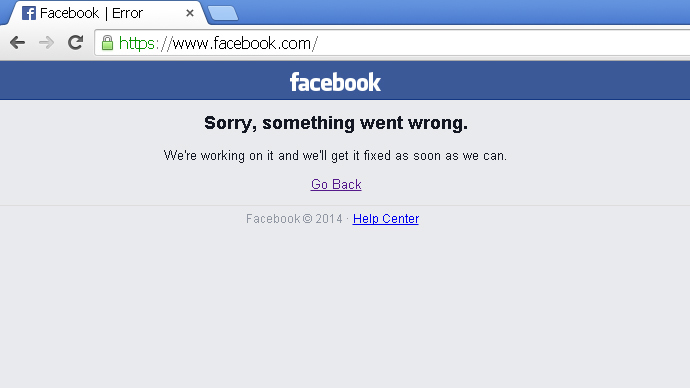 The hashtag #facebookdown has recently appeared on Twitter. The hashtag already tops Worldwide Trends on Twitter. The hashtag #ThingsIDidWhenFacebookWasDown has also become popular on social media. #ThingsIDidWhenFacebookWasDown Tell girlgirl that I liked her photo. In person. With an actual thumbs up. #RIPFACEBOOK and #RIPINSTAGRAM have begun to trend on Twitter. #FacebookisBack proclaimed the latest hashtag that was actively retweeted. A Facebook spokesman said in a statement emailed to CNBC that the outage "was not the result of a third party attack but …occurred after we introduced a change that affected our configuration systems."